Alford wants a network that is scalable and capable of offering high-speed connectivity and telephone service to each premise in the community. They estimate there are 734 utility poles on which to hang fiber-optic cable and that 22 miles of fiber-optic plant will be necessary. There are about 350 residential dwellings and 112 undeveloped lots in Alford, 17 miles of public roads, and 5 miles of private roads. The town encompasses about 12 square miles. The municipal network will connect to the MassBroadband 123 middle mile network, the state owned infrastructure. Alford's plans must be consistent with MBI’s Last Mile Program Guidelines for Unserved Towns in order to be eligible for MBI funding. Date for Bid Opening: Wednesday, December 21, 2016 at 1:00 P.M.
You can read the entire RFP on Alford's MLP website. 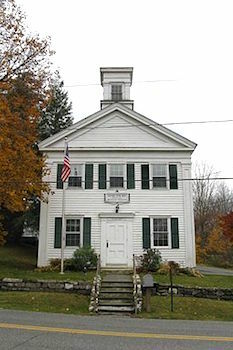 Photo of the Alford Town Hall John Phelan (Own work) [CC BY 3.0] via Wikimedia Commons.